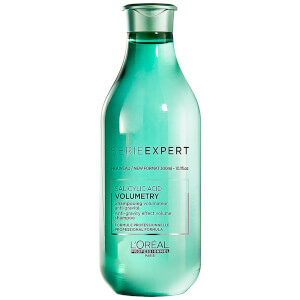 Nourishing and volume-enhancing, the L'Oréal Professionnel Serie Expert Volumetry Shampoo and Conditioner Duo will leave flat, fine locks full of body and bounce. A volumising shampoo that performs an anti-gravity effect to lift the appearance of hair at the root. Adding texture and volume without the weight, the clear shampoo contains Salicylic Acid to cleanse and purify, and Intra-Cylane™, an ingredient that expertly supports the hair fibre to leave it volumised at the root. Ideal for fine, flat and lifeless hair, the volumising conditioner uses key ingredient Intra-Cylane™ to create a supportive structure for each strand, providing intensive moisture without weighing hair down. 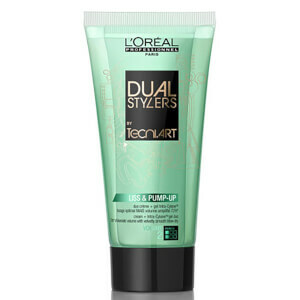 The formula gives a root-lifting effect, creating locks with body, bounce and thorough nourishment. Shampoo: molhe o cabelo e distribua o shampoo uniformemente. Massaje para fazer espuma. Enxague bem e lave as mãos depois de usar. Condicionador: aplique uniformemente no cabelo lavado com shampoo e enxuto com a toalha. Enxague abundantemente. Shampoo: Aqua / Water, Sodium Laureth Sulfate, Mipa-Laureth Sulfate, Sodium Chloride, Cocamidopropyl Betaine, Glycerin, Peg-18 Castor Oil Dioleate, Propylene Glycol, Peg-55 Propylene Glycol Oleate, Persea Gratissima Oil / Avocado Oil, Laureth-5 Carboxylic Acid, Ppg-5-Ceteth-20, Sodium Benzoate, Laureth-2, Polyquaternium-53, Salicylic Acid, Limonene, Linalool, Hexyl Cinnamal, Geraniol, Citral, Benzyl Alcohol, Hydroxyethyl Urea, Sodium Hydroxide, Citric Acid, Parfum / Fragrance. C158076/3. Conditioner: Aqua/Water, Cetaryl Alcohol, Behentrimonium Chloride, Aminopropyl Triethoxysilane, Starch Acetate, Cetyl Esters, Isoprpyl Alcochol, Lactic Acid, Hydroxyethylcellulose, Limonene, Linalool, Hexyl Cinnamal, Chlorhexidine Digluconate, Hydroxyethyl Urea, Geraniol, Parfum/Fragrance.